Home Defence Indian Air Force renames its arterial Panagarh airbase in Bengal: Know why? Indian Air Force renames its arterial Panagarh airbase in Bengal: Know why? 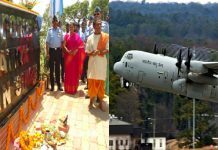 Kolkata, 15 April: IN an unprecedented move, the Indian Air Force (IAF) has rechristened its Panagarh airbase in Burdwan district of West Bengal. Panagarh airbase, which is at an advance stage of becoming IAF’s second C-130J Super Hercules hub after Hindane off New Delhi, is very crucial to ensuring security of India’s eastern skies extending up to the border with China in Arunachal Pradesh. IAF authorities today chose to rename such an important airbase to honour the only Marshal of the Indian Air Force, Arjan Singh. Panagarh airbase henceforth will be known as Air Force Station Arjan Singh. This is a rare honour for the 97-year-old Marshal, who is still fit and fine. Moreover, this comes on his 97th birthday. Singh was born on 15 April 1919 at Lyallpur in Punjab province; the place is now part of Pakistan after the division of India at Independence in 1947. At a brief ceremony held at Panagarh today, Air Marshal C Hari Kumar, the Air Officer Commanding-in-Chief, Eastern Air Command, unveiled a plaque containing the new name at the entrance to the Air Force Station. “On this day of rechristening of the Panagarh airbase to Air Force Station Arjan Singh, it is indeed a proud moment for all of us to be bestowed with such an honour,” Air Marshal Kumar said. “Air Force Station Arjan Singh, now with the induction of C-130J, would have a prominent role to play in our war waging capability, true to its name,” he added. Panagarh, approximately 150 kms from Kolkata, is located in Burdwan district of West Bengal. The airbase was constructed in 1944 during World War-II by USAF to cover, what is termed in military parlance as the China-Burma-India Theater. Coinciding this in the eastern theatre, a young commanding officer Squadron Leader Arjan Singh of the No 1 Squadron was leading the ‘Tiger’ squadron in saving Imphal Valley against the marauding Japanese forces. Sing’s leadership and daring exploits earned him a Distinguished Flying Cross (DFC), which was pinned on him by Lord Mountbatten in Imphal while the operations were still underway. Arjan Singh later rose to become the IAF Chief from August 1964-69. He was the first Indian Air Chief to be elevated to the rank of Air Chief Marshal on 16 January 1966. The elevation was in recognition of IAF’s vital contribution in the 1965 War under his able leadership. In recognition of his valued service, the Government of India conferred him the rank of Marshal of the Indian Air Force on 28 January 2002, thus making him the first and the only ‘Five Star’ rank officer of the Indian Air Force. The rank is equivalent to that of the Field Marshal Sam Manekshaw of the Indian Army. Throughout his service career and even thereafter, Marshal Singh has always displayed a deep and abiding interest in the welfare of air warriors and their families. In 2004, he established an independent Trust ~ Marshal of the Air Force and Mrs Arjan Singh Trust ~ with a personal contribution of Rs 2 crore. THe Trust is run by the Air Force Association. Marshal Singh continues to contribute in multiple ways to all IAF activities even today. Air Force Station Panagarh, post-World War-II, played a significant role in the 1965 and 1971 wars against Pakistan. Equipped with the Super Hercules aircraft, the airbase would now oversee tactical and strategic air operations in the eastern theatre. The renaming of Panagarh airbase after a much-revered icon of the IAF during his lifetime could not have been more significant now than ever before as Marshal Singh is just three years short of turning 100.